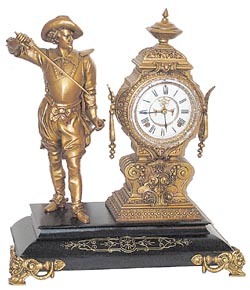 Ansonia Clock Co. figure clock, "Don Caesar", ca 1894. Enameled iron base and all bronze colored metal parts, completely refinished professionally. Looks very nice, including the gold in the base etchings. Refinished in Syrian Bronze colors. Case is 22 inches high, 19 1/2 inches wide. 8 day, half hour gong strike, 2 piece porcelain dial, open escapement, Rocco sash, beveled glass with small chip at 1:30. Beveled glass has a fault at 5:30, not chipped. Identical to clock pictured in Ly-Ansonia No.469, except Don\'s plume is missing from his hat.